Discourses of menopause are varied and complex, just as the lives of women themselves are diverse and multifaceted. Traditionally, menopause has signalled the end of the child-bearing years and the "change of life," a time when women might experience a great deal of change, in many ways. But menopause can also be understood as a natural physical change, or a time of hormonal change, or as a passage from one way of life to a different one, often accompanied by emotional flux and changes in ways women think about themselves. 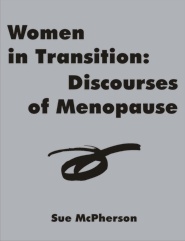 For this study of menopause and women’s lives, using life story methodology I have gathered information, anecdotes, poems, and personal revelations through interviews conducted with ten women. Drawing on the stories of their lives, I have explored the ways women think about their experience of menopause and related aspects of their lives. The feminist poststructuralist framework I have used consists of two elements, poststructuralism and feminism. The poststructuralist framework uses theories of language and concepts of discourse, dualisms, subjectivity and consciousness, power, diversity, and context. Taking a feminist approach to poststructuralism enables women’s voices to be recognized as meaningful within this framework, while acknowledging the possible restrictions of society’s structures as well as women’s agency in their personal lives and within society. From a poststructuralist perspective, the aim is to increase understanding through a multiplicity of methods, from exploring the historical background and existing research on menopause, and presenting the data in a variety of ways. In this research, the data is displayed in a form that enables readers to read and reflect on what the women say and on their creative writing, with minimum input from the researcher. Separately, the data is examined from the perspective of feminist sociology. The research process, for myself, was one of learning through talking with other women, delving into different forms of knowledge, and coming to think in new ways. Sue McPherson returned to university in Ontario, Canada, as a mature student, earning degrees in sociology from the University of Western Ontario (HBA, 1993) and the University of Windsor (MA, 2002). A researcher and writer, whose writings may be found on her websites, her main interests are exploring the lives of men and women within society as they age, and writing life stories, usually in connection with a particular theme. The emphasis in these endeavours is on diversity, and on individual development and the events and changes in society associated with that.